We love curves at Hourglass Angel, and that's why we're passionate about plus-size styles. Think that certain styles are off limits because of your dress size? Think again. It's not so much about what you wear as how you wear it. Want to have a flattering plus-size wardrobe that makes you excited to get dressed every morning? Here are five fashion secrets every curvy woman has to know, inspired by a great post over at Bustle. Go bold or go home. What are some of your favorite features? 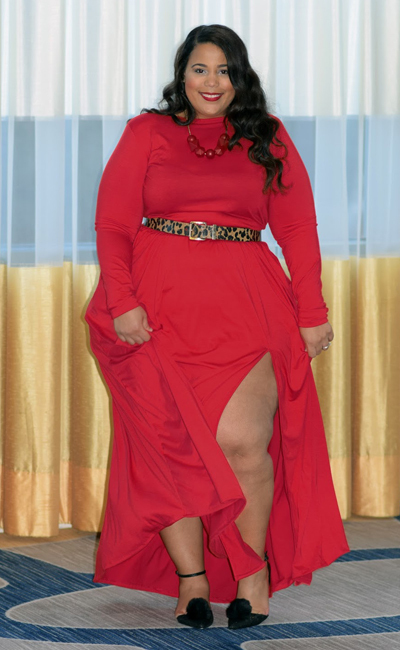 Use bright colors and large prints to draw attention to your curviness. Even just a touch of color at your bust and hips can bring an outfit to life and create elegant lines in your outfit. This is a classic style that works anywhere from the workplace to a picnic to a night out. It makes a curvy shape look elegant (especially when you've got some great shapewear as a foundation!). Dress it up or down with your choice of jacket, shoes or accessories. While you might instinctively think otherwise, rompers can be very flattering for a curvy figure because they flare at the waist; high waist shorts can also work to your advantage. Clothing retailers are getting smart and offering more of these flirty styles in plus sizes. If you wear a plus-size, you can wear anything. Really! The key is finding the garments that fit like a glove. Don't settle for something that doesn't flatter your figure. Remember, it can also help to wear shapewear as you shop, so you can get an accurate idea of how great you can look in the right outfit. Wearing only what makes you feel gorgeous is going to give you a huge confidence lift no matter where you go. This in turn will help you stand up straighter and smile more. Throw out the old styles, the pieces that don't fit right, and invest in the clothes you really want.